No matter what you need, we'll help you find it. Plus, you'll always beneift from our wholesale prices, which help you keep more of your hard earned cash. You can quickly browse for your riding mower parts by brand, or you can enter your part number. If you don't know your part number, we'll help you find it. You can also get in touch with us at any time for more information or for any type of assistance. Call us at 800.937.7279, and we'll help you get started today. With over 1.2 million parts available, we'll always have the perfect riding lawn mower parts you need to get your equipment back up and running in no time at all. Have your riding mower part number ready? 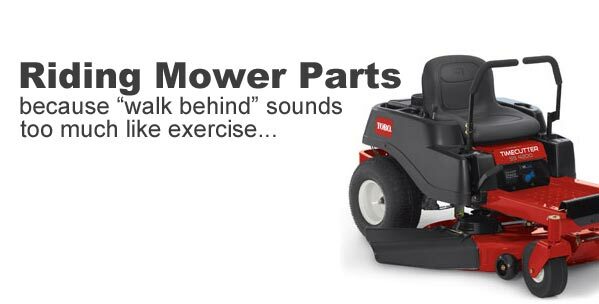 Search for it above to find the replacement riding mower part you need! If your riding mower doesn't go anywhere, it's really not a riding mower anymore. So whether you need a replacement transmission or just a belt to get your machine in working order again, RCPW has the parts you need at a price you can afford. Save up to 77% on aftermarket parts for your riding mower or save big on retail prices with genuine replacement parts. Order online or call today at 800-937-7279.